My husband is in Ogden, Utah to compete in the USA Cycling Masters Road National Championships which takes place this week. Since we only have one car in our household and he left this morning with it loaded up, it means I will be living car free until his return. I don't say this for pats on the back because I know of people who live car free as a lifestyle like Bekka, author and illustrator of Bikeyface, and those featured on Carfree American. These are people who are not temporarily carless as in...a few days. They made a decision to BE carfree. And there's not that many in this town that I know of. There's not that many bicycle commuters either. About less than 200 in Reno and Sparks. I say all this because it is kind of scary not having a car on stand-by (although I could have arranged for one) should I need it. And although I have not needed a car to drive except for once a month, the thought of not having the security blanket of my husband who is now 7+ hours away, with the nearest relative 5 hours way in case something should happen to me makes me kind of nervous. But it's not like we haven't been here before. We have been a single car household for over two years. After we moved to Reno we realized that having more than one vehicle for just the two of us was overkill. Our second vehicle was only being driven during the work week, to get me to and from the office. It seemed like a waste. After all we were paying for the loan, insurance, registration fees, fuel, maintenance and parking at my work site. So we made a decision to live with just one car. Initially my husband, John didn't think we could do it. It was understandable because he would go through cars like a revolving door; switching vehicles as quickly as 6 mos. The longest we've stayed in the same vehicle was 3 years. So I reassured him that we can always get a second car if we really needed to. But at least we can try to live with one less car. And that we did. So now we pay ourselves about an extra $8,600 a year instead of the funds becoming a sunken cost for transportation. And I don't miss it having a second vehicle one bit. Now I ride my bike everywhere I need to go: to work, to run errands, to meet friends, to medical appointments and even take our pets to the vet. If I am not riding my bike then I am carpooling with my husband and on occasions with my colleagues. Other times I will ride somewhere and he will meet me for dinner or an event and then we load up my bike to go home. Once a month I drive to the Regional Transportation Commission Bicycle and Pedestrian Advisory Committee meeting. When we both need to be somewhere, we work out our transportation logistics but those times rare. If you need a car, you can always borrow mine (as long as you can drive a stick). 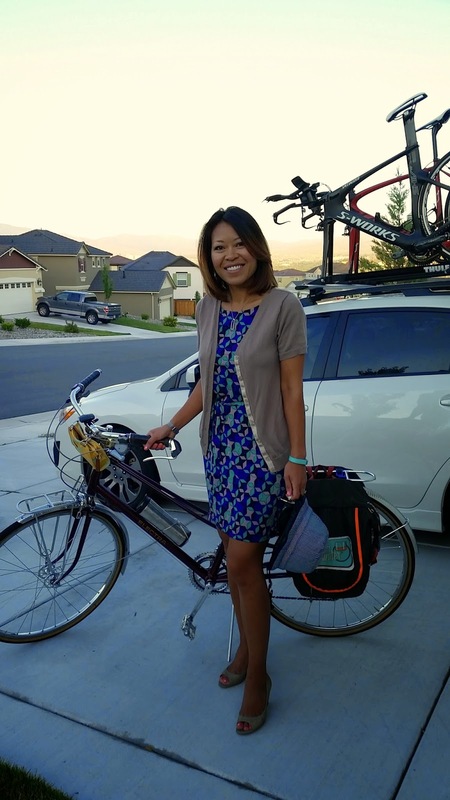 My Fiance and I live in Reno, and have thought about becoming a single car household since I started commuting by bike to work in June (we'll see how I do in winter fist!). It's really great to know that it can work out! Hi Ellie, that's so exciting!! I hope you'll keep me posted. During the winter when the weather is bad, we carpool. That quality time together gives us a chance to talk about our day! Just Do It .. Later.